On Saturday, March 17, Conner Contemporary Art opened its doors to the public for a reception to celebrate and welcome the gallery’s two newest exhibitions, including Janet Biggs and her video installation, Kawah Ijen. The New York-based artist, known primarily for her work in video, photography and performance art, is currently exhibiting her multi-channel installation and single-channel video, “A Step on the Sun,” alongside performance and sculpture artist, Wilmer Wilson IV’s Domestic Exchange. Both exhibits run though May 5, 2012. Biggs’ documentary-style installation, Kawah Ijen, evokes a mixture of “natural beauty and human exploitation,” as it chronicles the laborious tasks of a sulfur miner in the breathtakingly beautiful, yet perilous, Ijen volcano in the East Java province of Indonesia. 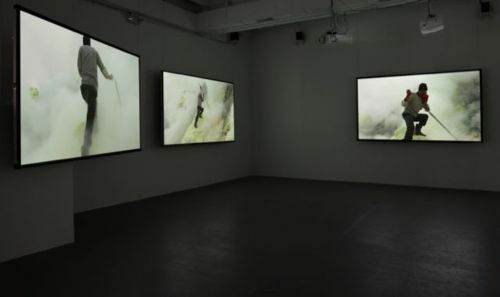 The piece is accompanied by a soundtrack of noises recorded inside the volcanic mine, and the video depicting the sulfur miner at work is juxtaposed with images from the National Oceanic and Atmospheric Administration and MIT photos of an experimental weather balloon launch. Biggs’ work has been exhibited, among other institutions, at the Herbert F. Johnson Museum of Art, Ithaca, NY; Everson Museum of Art, Syracuse, NY; Gibbes Museum of Art, South Carolina; Rhode Island School of Design Museum; Vantaa Art Museum, Finland; Linkopings Konsthall, Passagen, Sweden; the Oberosterreichisches Landesmuseum, Austria; and the Perth Institute of Contemporary Arts, Australia. She recently had solo exhibitions at The Mint Museum of Art, Charlotte, NC and the Tampa Museum of Art, Tampa, FL and will show at the Musée d’art Contemporain de Montréal in the Fall of 2012. Perhaps this show will keep Biggs working in DC more? We hope so! Visit http://www.connercontemporary.com/ for more information on the exhibit and gallery times.